MILFORD, Mass. – Despite it being the first quarter of the first game of the season for Milford, the Scarlet Hawk defense looked in midseason form. Using full court pressure and a 2-3 zone, the Hawks gave an experienced Algonquin team fits, forcing 11 turnovers and holding the Tomahawks – D1 Central finalists a season ago – without a field goal for the opening period. But on the other end of the court, the Scarlet Hawks weren’t able to capitalize on the strong defensive work, and after one quarter, were tied 8-8. From there, Algonquin’s offense slowly got going in the second and then exploded in the third game, turning a one-possession game into a double-digit lead, resulting in a 67-51 win over the T-Hawks. “I thought we came out great in the first quarter, [Algonquin] didn’t even have a field goal just eight free throws, so our defense was very good,” said Milford head coach Paul Seaver. “We find positives from this first game, that’s what we have to do to get better. Algonquin was in the D1 Central final last year, they are a very good program, that freshman [Alex Karaban] is a hell of a talent, and they have two of their top three scorers back in addition to that. A three-pointer from Brendan White (21 points, seven rebounds) opened the scoring and then a steal from White led to a three for Brendon Sailer (eight points) and another turnover led to a layup for junior Colby Pires, giving Milford an 8-2 lead. But the Hawks offense sputtered the rest of the quarter, finishing 3-for-15 from the field and the T-Hawks cashed in with eight free throws to knot the game 8-8 after eight minutes. Milford’s offense got back on track to start the second quarter, rattling off a 9-1 run over the first two minutes to jump ahead 17-9. The Hawks hit three of their first four shots – a bucket down low from sophomore Jordan Darling, a three-point play from White, a triple from Danny Corsini (eight points), and a free throw from White – to take the lead. But over the final 5:51, the Hawks went without a field goal (0-for-10), adding just one free throw while the Algonquin offense found some rhythm. The T-Hawks scored seven straight points, including their first field goal (a three from junior Artem Segarra) and finished the half with a 12-1 run to take a 21-18 lead into the break. “They came out man-to-man and I think we did a nice job against that and got a lead but they switched to their 1-2-2 zone, which we were expecting, but we went ice cold,” Seaver said. “We knew it was coming at some point, but we just weren’t able to step up and knock down shots. But that’s what happens early in the season, that’s why we come to practice tomorrow and get better, we have to be an improved shooting team. 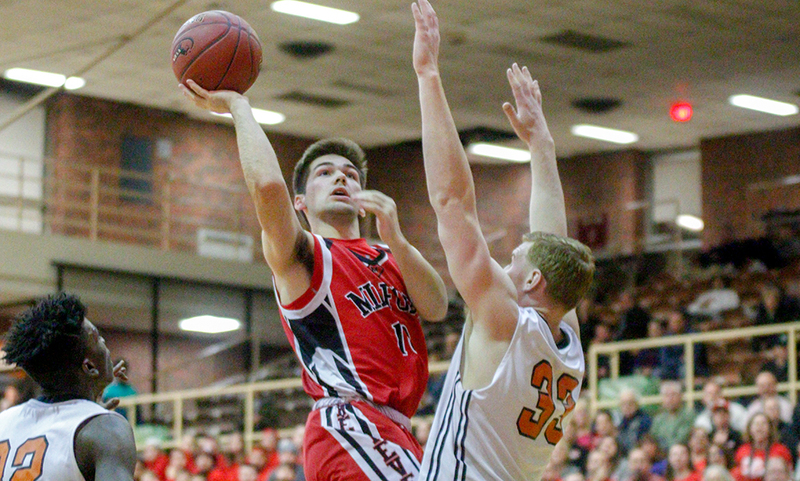 Milford’s offensive woes continued into the third quarter as Algonquin – which has 10 seniors on the roster and five juniors – opened the frame with a 9-0 run over the first three minutes. On top of their experienced players, the T-Hawks feature 6’7 freshman guard Alex Karaban, who scored 21 points in the win following a 26-point performance in Algonquin’s season opener on Friday. Karaban hit a pair of threes in that run, the points coming from senior Nick Redden (16 points, 14 rebounds). A three from White ended the Algonquin run and a bucket from Darling made it a single-digit game (32-23), but Redden answered with a triple. A three from Sailer cut the deficit to eight with three minutes to play but Algonquin closed the third on an 8-0 run to stretch the lead to 14 (45-31). Milford continued to push in the fourth quarter but couldn’t get the game back to single digits over the last eight minutes. “They hit the shots we needed to hits,” Seaver said. “That really sums it up, we had some looks, they just didn’t fall for us tonight. That’s an experienced team, we lost seven seniors from last year. We have guys in new roles and a handful of guys that played in their first varsity game and that’s a tough team to do that against. 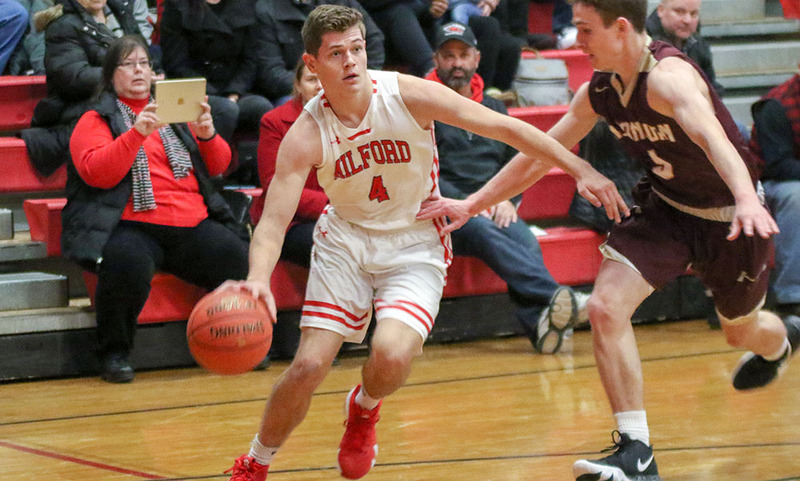 Milford boys basketball (0-1) begins Hockomock League play on Tuesday when it travels to play Franklin, the team that beat Algonquin in the D1 Central final a year ago.